The UK is made up of England, Scotland, Wales, and Northern Ireland. Each constituent is often associated with a stereotype – the Irish leprechaun or the Brit in full tweed who struggles to go five minutes without a cup of tea. But if you’re interested in going a little deeper into what makes this nation great, then I’ve put together my top insider tips for getting to grips with UK culture. First, it’s probably important to admit that the British do actually drink a considerable amount of tea. To be exact, 163 million cups of tea daily. This is about 20 times the number of cups consumed by Americans. Traditional British foods include battered fish and chips, pork pies, and the traditional full English breakfast. But in truth, few foods are traditional across each part of the UK. In the North West of England, top traditions include Lancashire hotpot, a lamb and vegetable dish topped with sliced potatoes, and Eccles cakes which are made from flaky pastry packed with sweet, sticky fruit. Further up in Scotland, traditional fayre can include Arbroath smokies, smoked haddock which is eaten for breakfast, and of course haggis, minced sheep organs which are stuffed into the lining of a sheep’s stomach and boiled. You’ve got to be pretty determined to try that last one, and it isn’t that common to find it on menus. TOP TIP: You can expect to encounter a wide variety of foods in the UK. As a multicultural nation, Britain’s favorite dishes include curry, Chinese food, and spaghetti Bolognese. Many Scots have never tried haggis before and speaking as a Brit, I’m not personally a huge fan of pork pies. It won’t surprise you to know that the Royal Family is a big deal in England. But what you might not know are some of the customs surrounding how the public celebrate and interact with the monarchy. For example, each year in June the country celebrates the Queen’s Birthday. On particularly important birthdays there are parades, parties, many businesses are closed, and families get together to have family time. But this isn’t just a one-way affair. In the UK, the Queen also sends personalized birthday cards to every person celebrating their 100th and 105th birthday and any birthday after that! This is a tradition that stretches back to King George V in 1917. Often when members of the royal family get married, there is also a public holiday so everyone can celebrate. Each year the BBC also produces The Royal Variety Show, which is attended by the royal family, celebrities, and the public. The show raises money for charity, and only the best musicians, comedians, and dancers are chosen for the honor of performing. Lastly, and perhaps my favorite fact, did you know the Queen owns all of the swans in England? TOP TIP: Because of England’s monarchy, you can find castles, palaces, and beautiful national heritage sites all over the country. Keep this in mind if you plan a visit, the British are all about history. It might interest you to know that football, rugby, golf, boxing, and cricket were all invented in the United Kingdom. Football actually got its start in England when Anglo-Saxon farm workers unearthed the skull of a Danish warrior. They passed the skull between them to amuse themselves and called the sport ‘Kick Dane’s Head’. Besides sport, there are many kinds of entertainment in the UK that you may not have heard of. Morris dancing involves a small troop of people dressed in colorful rags and ribbons dancing a sort of folky hop-and-skip while shaking bells and sticks. Though it sounds bizarre, the practice is very common around the Welsh borders and happens in many rural villages nationwide. Another entertaining tradition is that of the Christmas pantomime. This musical comedy stage production is performed throughout the UK during the festive period. It can include songs, gags, slapstick comedy and dancing. There are often gender-crossing actors, and the story usually focuses around a fairy tale or fable. It’s also a participatory form of theatre as the audience is often asked to sing along and shout out well-known phrases with the performers. TOP TIP: When it comes to national pride, the UK has tons of it. Expect people to be very passionate about their football teams, fond of their Morris dancers, and involved in their community’s pantomimes. 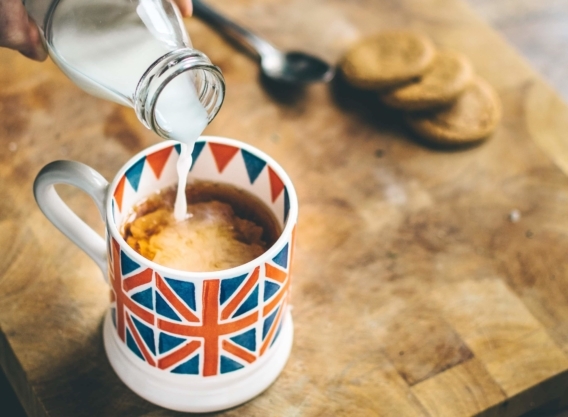 These are just a few of the many qualities that make the UK unique, and although I can’t claim that every stereotype is false, there’s definitely more to us than a good cup of tea. At our two EF Academy UK boarding schools, contemporary learning is combined with Britain’s academic traditions for the ultimate pre-university experience. Take your education to new placesGo!